Remember how play forts were the best thing in the world? Even I, a confirmed claustrophobe, loved small private (or semi-private) spaces as a child. Taking out the drawers from the bottom bunk and hanging out under the bed with my older sister Emily, or later on when I changed roommates, walling off the corner bunk with sheets and conducting secret business (of some kind) with my younger sister Beth. And it’s best if you find or create it yourself. 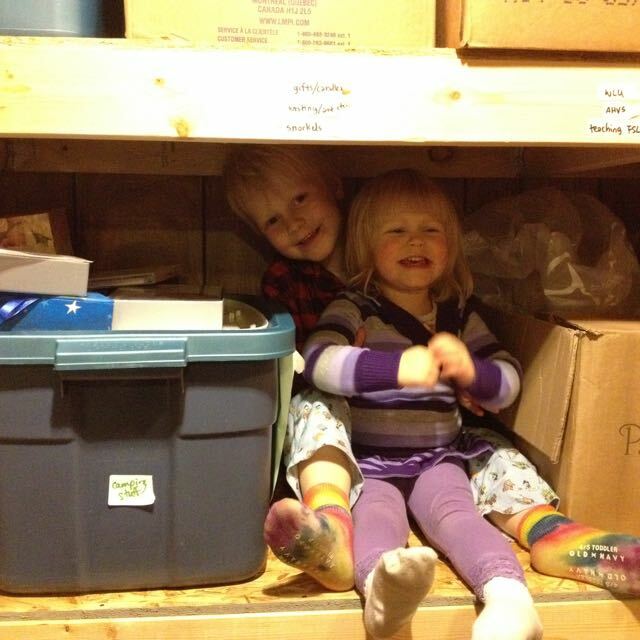 E and AB have an Ikea circus tent that makes a lovely fort, and a big sturdy cardboard box with “windows” for another one, but they scoped out these storage shelves themselves, so they’re automatically a cooler fort. Like a bear cave or a forest nook, self-discovered. Plus: two storeys, below-shelf and above-shelf. Doesn’t look comfortable, but who cares? We still have the jumping platform. Where should it go? And: comfort, shmumfort!